One of Hestra's best known gloves has been used by use in the last year. Is it worth the relatively high price tag? I invested in a pair of these gloves at the beginning of last season and used them every day I was out, as well as a few days at home when the weather was cold enough. I found them comfortable and dry in all conditions and even skiing off-piste or doing stuff like snow-pack analysis where your hands are in the snow, I didn’t feel my hands getting cold or wet. Any dampness I noticed I’m pretty sure came from my own perspiration. 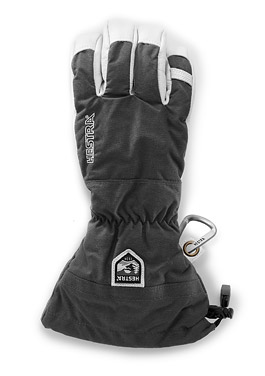 The warm, removable liner makes even that an easy thing to deal with and splitting the liner and outers apart and leaving them overnight guaranteed me dry gloves in the morning. The leather holds up well with obvious signs of use, but no cuts, tears or visible damage. I have been treating them with the Hestra glove-balm and it does make a difference to how supple and water repellent the leather palm is. At £90 they aren’t cheap and some similar gloves could be had for less, but I’m not convinced that ‘similar’ is enough to tempt me to save a few quid. These really are worth the money.